The majority of my practice revolves around me reacting to materials. I tend to work on different series simultaneously. Some, one could say, are more traditional ways of painting; however, very often things happen on the periphery. Sometimes, these ‘things’ become of equal or more importance than the original direction. I like rescuing the leftover materials that come from the process of making my work; whether it be: drawing, painting, installation or sculpture. I am interested in giving these fragments an opportunity to have a second life. The subject matter in my work varies, often times it is informed by my being a migrant; liminiality, a feeling of not being here nor there; and the imaginary, whether it be the line that delineates our borders, or the perception of the unimagined as seen through new materials or technologies. I am intrigued by how the ‘presence of absence’ can generate new realities, hybrids of existing forms, and for me, transformation of environment and sense of self. By painting disembodied animals in a landscape, organic ambiguous body parts that bond or intersect onto each other, and resurrecting the unexpected; I want to put in front of the viewer a labyrinth, a puzzle they can resolve themselves, and encourage them to reflect on the idea of the indefinite—the always becoming. María photographed in her studio alongside her work. What was your first introduction to art growing up in Mexico City? There is a mural in Chapultepec Castle by Juan O’Gorman titled “Retablo de la Independencia”. It made a huge impression on me the first time I saw it. This mural, like many others throughout the city documents the history of México with scenes of daily life; picturing its people, its heroes and social struggles. Every time I visit it I find new areas in the painting to study. I can look at this hugely elaborate mural forever. As a maker (or painter), my first introduction was in junior high school, when I took oil painting with one of my most influential teachers. It was a formal and structured class, a good beginning to my education in painting. How did relocating to Santa Barbara impact your progression as an artist? I lived in the Los Angeles area for a number of years before I moved to Santa Barbara, which is where I went to grad school. Community (as in fellow artists that I can exchange conversations with), is a particularly valuable aspect of grad school. I am fortunate that I can now continue a dialogue with artists here and in Los Angeles. Both Mexico City and Los Angeles are stimulating big cities as opposed to Santa Barbara, which is a much smaller place surrounded by spectacular nature—nestled by mountains and ocean. One can walk from zero to 4000 feet elevation in just 13 miles. I think living here has influenced the work I make. Landscape (figuratively and conceptually), has become an important aspect of my work. Can you explain your affinity for and attitude toward abstraction as a painter? I have always gravitated towards not telling the whole story, even if I am working from a specific reference. I avoid the literal hoping that my paintings give the viewer room for interpretation. For a while, I have tried to make work that suggests absence by omitting some of the critical elements of an object, a figure, a space or a landscape. Sometimes I do this by working from memory, from the memory of having looked at a real or photographic source. 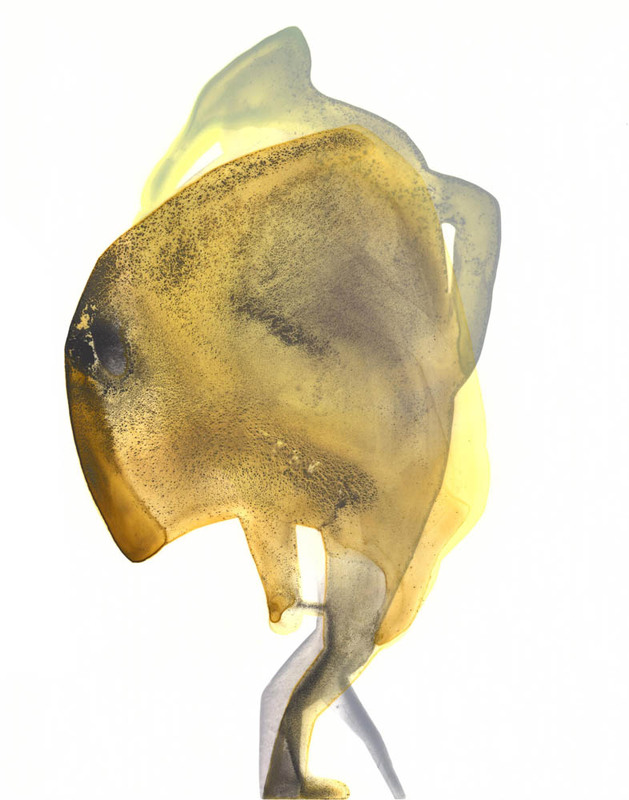 In my series Two by Two, I work form observation (photographs and drawings in an encyclopedia of animals). I initially paint parts of the complete animal, then I close the book and continue to work on the piece without looking at a reference until I finish. I want my work to have a sense of mystery; both in the forms that I paint and in the way I make it. I know chance and control are important aspects of your process. Can you talk more about this? I want the materials I use to have some autonomy. 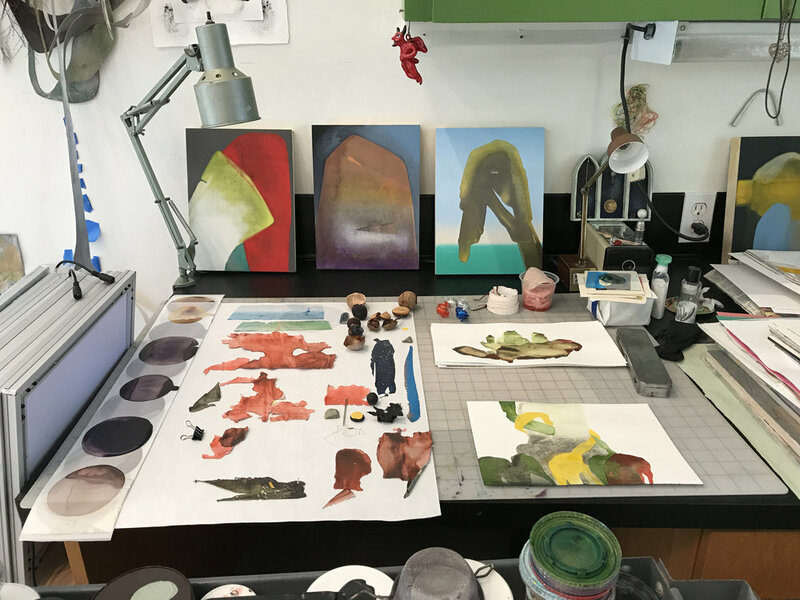 I am partial to getting surprised by the many variables in my painting process; the different surfaces, gravity, type of paint, paint viscosity, application tools, etc. In the majority of my work, I use paint in very liquid form, which takes a long time to dry and is somewhat unpredictable. If I’m in the studio while certain pieces are drying, I sometimes manipulate them in the process. Other times I leave them overnight discovering what the paint has offered the next day. Painting for me becomes a kind of collaboration between my materials and my controlled marks. Would you describe your studio as a controlled environment? Does the size of the studio affect the scale of your work? It is a controlled environment; although, I have worked outside at times. My studio is a 400 square foot space divided in different sections. I have a desk where I draw, read, write and sometimes make collages or small works with dry material. 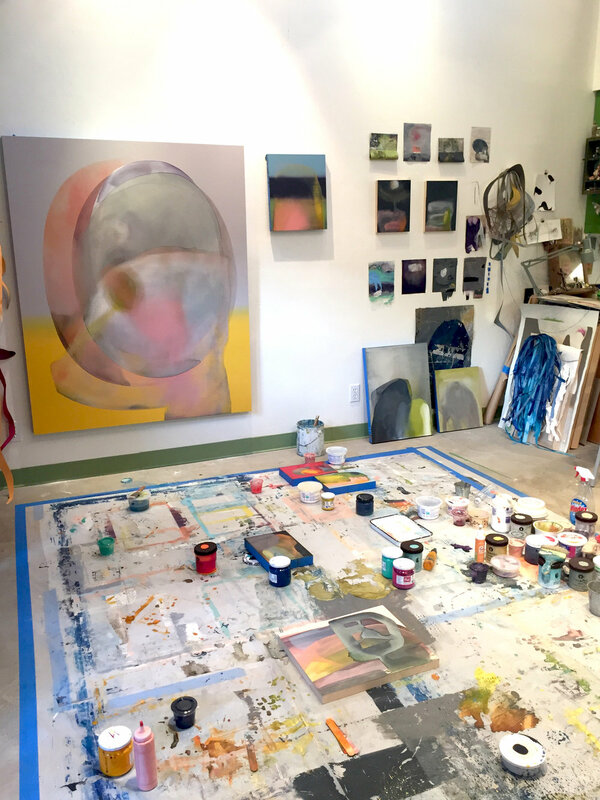 Half of my studio is covered with plastic, where I work (horizontally) on most of my large and midsize paintings. Yes, the size of my studio influences the scale of my work. I have often fantasized about renting a large space for a couple months to approach large works the way I approach making smaller paintings (which is, working on 10 to 12 pieces simultaneously). In my present space I can only work on two large pieces at a time, which tend to be more calculated than the small works. 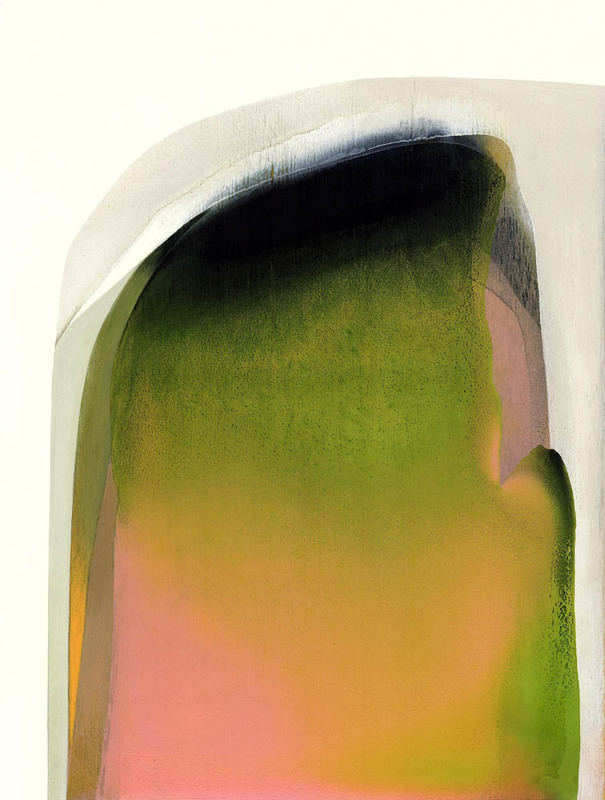 Your work feels reminiscent of Helen Frankenthaler and other Color Field painters. Who are some of your major influences? There is a painting by Helen Frankenthaler in the permanent collection at LACMA (Los Angeles County Museum of Art), titled Renaissance. Every time I visit the museum I make a beeline to see this painting. It has a wonderful sense of abandon and assertiveness. I could look at it forever. I also love to look at paintings by Giorgio Morandi and Milton Avery. They both have a graceful way of making the subject matter in their paintings have autonomy. Morandi, with his exquisite color palette and Avery in the way he reduces his forms. I also could look at their work for a long period of time. I have many artists I admire: Georgia O’Keefe, Francis Bacon, Odilon Redon, to name a few. Are the reductive forms in your work informed by specific landscapes? I haven’t referenced specific landscapes, but animals; as mentioned in a previous answer about my approach in the series Two by Two. I have also referenced stains that I find on asphalt during my daily walk, made by water or oil. I photograph the forms, which in turn become the inspiration for the figures in my paintings. I don't trace them verbatim; rather, their impression is the genesis of my first marks to expand upon. What intrigues me about these forms is their fleeting existence; since my route is the same every day I notice some disappearing in days, while others linger taking months to dissipate. Do you work from life, photo documentation, memory, or a combination of these? A combination. Discussed in previous answers. How do you determine the palette for works such as Muammar or De Horizontal A Vertical XV? And for the Two by Two series? 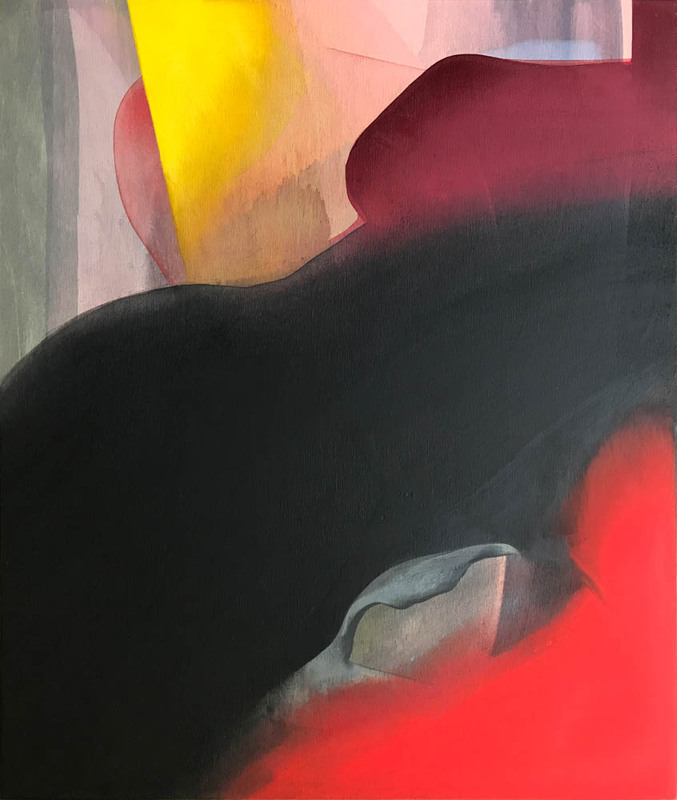 In the case of the Two by Two series (since each piece references an animal), the color is sometimes associated with the species’ surroundings, or their actual color. In the works where there is a background gradation of hues, I referenced a landscape of unnatural colors, colors that might have an apocalyptic sense to them. I would say though, that most of my palette choices happen intuitively. When working on panel, you apply thin, transparent layers of acrylic interrupted by more opaque, matte passages. Why do you prefer working with acrylic and Flashe? I like the immediacy and versatility of acrylic; how fast it dries and the fact that it's not water soluble after it dries. I work with very diluted acrylic, which makes it very transparent and extremely fluid; pigments separate, paint runs outside of my initial marks—I like that. I love Flashe because it dries flat and velvety like gouache but it's not as fragile. It’s a high pigmented paint, therefore the colors are very vibrant. I mix the two together sometimes achieving surfaces with a lot of depth to them. I feel like there is plenty more to explore with these two materials. You seem to use various methods to achieve subtle gradations of color. Can you talk more about the tools you use and your painting process? I generally apply the paint with brushes, preferably ones that can soak up a lot of water. Sometimes I pour paint directly on the surface and coax it to the areas where I want it to go. I tend to try different ways of application off and on, but most of the time it’s just brushes. What significance does the act of diluting paint with rain water, tap water, and holy water have for you? Water is crucial to our existence. I live in California, in an area that is identified as a place with extreme drought. In 2015 I made an installation titled The Snow Man, initially inspired by the contrast between the abundance of water, as in flooding; and the lack of, as in an extreme drought. I am intrigued about how this dichotomy of too much or too little affects our relationship to how we use water, how we save it, how we stretch it, how we honor it. The title was inspired by a poem by Wallace Stevens: The Snow Man. I made the majority of this piece outside where it started raining on it. I then decided to save rain water; essentially a liquid that was being gifted to me by nature, and began diluting paint with it. At the time, I was very aware of the fact that water was everywhere (I live near the ocean) but it was scarce for our everyday use. The holy water comes from my childhood. My great aunt, who lived with us had a small altar with a receptacle of water that she had blessed by the priest at church. Every time we were about to leave the house she would tell my siblings and I: “ponte agua bendita” (put holy water on yourself), so nothing bad would happen to us. I am not a practicing Catholic but I like living with this tradition, ritual, or I guess one could call it a superstition. I usually put drops of both, rain and holy water, mixed with mostly tap water in each of my mixed paints. You often reuse peripheral materials, such as paint skins, to create small scale works. Do you think of these as studies for paintings or do they function as stand-alone drawings or collages? I consider these small works or collages stand-alone. I have attempted to use them as studies but have never succeeded because the materials behave so differently when used in small scale versus large scale. You’ve stated that the majority of your practice revolves around reacting to materials. Do you often introduce new materials or do you prefer to experiment indefinitely within a narrow selection? Lately I have concentrated on traditional painting materials but in the past I have experimented with cotton candy, ground spices like turmeric and paprika, tree bark and other more sculptural materials. For now, I still have a lot to explore with acrylic and Flashe. You typically work in series comprised of uniformly sized works. How do you know when a series is finished? I work on multiple series simultaneously so it is hard to pinpoint when they might be done. I think of them influencing each other. I see Two by Two as an ongoing series that could go on indefinitely. I thought I had abandoned the Oocytes but just recently I made two more, never hurts to keep an open mind. What type of studio scenario do you need to get work done? Can you tell us a bit about your workspace? What are absolute necessities in the studio? I spoke about it in a previous answer. I would love to have a larger space to work on pieces of larger scale simultaneously. I have also enjoyed working outside the studio on site specific installations. Is there anything that significantly supports or destroys your mood or energy in the studio? Light. One side of my studio has two glass doors that face west. In the late afternoon, light comes in the studio quite sharply and floods the floor with shadows from the trees and plants outside. Since I work horizontally sometimes those shadows are completely in the way of my decision making. In the morning, on the other side of the studio where my drawing/reading table is, the windows let in the most beautiful light for drawing and reading. I like working with natural light. Pedro Páramo, written by the Mexican author Juan Rulfo. The narrative is mysterious in the sense that you never know if some characters are alive or dead, or if the places where the story happens are real or not. Jorge Luis Borges was inspired by this book and I also like reading him, especially his short stories. I love the poems by Sor Juana Inés de la Cruz, a Mexican nun that lived in the later part of the 1600s. She is considered the first feminist in the new world. Right now I’m reading, listening actually to The Bell Jar by Sylvia Plath; and slowly taking in What is Art by Leo Tolstoy. It is important. Recently I go between audiobooks, podcasts and music, depending on what I am working on. If I’m focusing on a project that takes a lot of decision making I tend to go to music but if I’m just mixing paint, priming panels or peeling paint, I generally listen to a podcast or a book. Spend rigorous time in the studio, you never know where the work will lead you. For me, experimentation triggers ideas, as much as ideas trigger experimentation. I see my practice as always becoming the next thing. Also, the notion of being mindful of what I am doing and why I am doing it. This keeps the energy in the studio alive. What is one of the things that might be most beneficial to your career as an artist at this point? Continue having conversations about art and painting with artists that I admire. On a personal level, it would be an honor to exhibit my work in my hometown, Mexico City. The paintings by Nicole Eisenman at Susanne Vielmetter in Los Angeles earlier this year were outstanding, both physically and conceptually. Besides art, what are some of the things that interest you or that you enjoy the most? I love walking, especially up hills. In Santa Barbara there are a few trails and roads that I walk regularly. I like going high enough to be rewarded with a good view. What’s next for you? Do you have any upcoming projects, residencies, or exhibitions you’d like to share? I have a few things in the pipeline. I am currently in the Advanced Mentorship Program at Anderson Ranch with Enrique Martinez Celaya. I look forward to continuing next summer, the second of three.